The Ancient Egyptians had a scientific and organic system of observing reality. Modern-day science is based on observing everything dead (inanimate). Modern physical formulas in our science studies almost always exclude the vital phenomena throughout statistical analyses. 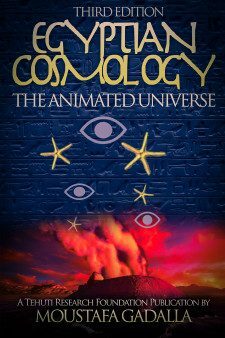 For the Ancient and Baladi Egyptians, the universe—in whole and in part—is animated. In the animated world of Ancient Egypt, numbers did not simply designate quantities; but instead were considered to be concrete definitions of energetic formative principles of nature. The Egyptians called these energetic principles neteru (gods, goddesses). For Egyptians, numbers were not just odd and even—they were male and female. Every part of the universe was/is a male or a female. There is no neutral (a thing). Unlike in English, where something is always he, she, or it; in Egypt there was only he or she. The upright, therefore, may be likened to the male, the base to the female, and the hypotenuse to the child of both, and so Osiris may be regarded as the origin, Isis as the recipient, and Horus as perfected result. Three is the first perfect odd number: four is a square whose side is the even number two; but five is in some ways like to its father, and in some ways like to its mother, being made up of three and two. And panta [all] is a derivative of pente [five], and they speak of counting as “numbering by fives”. Five makes a square of itself. The vitality and the interactions between these numbers show how they are male and female, active and passive, vertical and horizontal, etc. 2 – Plutarch noted that One, for the Egyptians, was not an (odd) number when he wrote: three is the first perfect odd number. For the Egyptians, one was not a number, but the essence of the underlying principle of number; all other numbers being made of it. One represents Unity: the Absolute as unpolarized energy. One is neither odd nor even, but both; because, if added to an odd number, it makes it even, and vice-versa. So it combines the opposites of odd and even, and all the other opposites in the universe. Unity is a perfect, eternal, undifferentiated consciousness. Rules for inquiring into nature and for knowing all that exists, every mystery, every secret. The intent is very clear—that Ancient Egyptians believed in and set the rules for numbers and their interactions (so called mathematics) as the basis for “all that exists”. 5 – The famous Ancient Egyptian hymn of Leiden Papyrus J350 confirms that number symbolism had been practiced in Egypt at least since the Old Kingdom (2575-2150 BCE). The Leiden Papyrus consists of an extended composition describing the principle aspects of the ancient creation narratives. The system of enumeration, in the Papyrus, identifies the principle/aspect of creation and matches each one with its symbolic number. This Egyptian Papyrus consists of 27 stanzas numbered from 1 to 9; then from 10 to 90 in tens; then from 100 to 900 in hundreds. Only 21 have been preserved. The first word of each is a sort of pun on the number under concern. Some parts of the Leiden Papyrus will be discussed in conjunction with number mysticism/evaluation in the next chapters. However, a complete analysis is found in Egyptian Alphabetical Letters of Creation Cycle by Moustafa Gadalla. 6 – The Ancient Egyptian name for the largest temple in Egypt, namely the Karnak Temple complex, is Apet-sut, which means Enumerator of the Places. The temple’s name speaks for itself. This temple started in the Middle Kingdom in Ca. 1971 BCE, and was added to continuously for the next 1,500 years. The design and enumeration, in this temple, are consistent with the creation numerical codes. The Egyptian concept of number symbolism was subsequently popularized in the West by and through the Egyptian-educated Pythagoras (ca. 580–500 BCE). It is a known fact that Pythagoras studied for about 20 years in Egypt. Pythagoras and his immediate followers left nothing of their own writing. Yet, Western Academia attributed to Pythagoras the so-called Pythagoreans, an open-ended list of major achievements. They were issued a blank check by Western academia. Pythagoras and his followers are said to see numbers as divine concepts – ideas of the God that created a universe of infinite variety, and satisfying order, to a numerical pattern. Some of the numbers and their symbolic significance will be described briefly in the following chapters. Creation is the sorting out (giving definition to/bringing order to) all the chaos (the undifferentiated energy/matter and consciousness) of the primeval state. All of the Ancient Egyptian accounts of creation exhibited this with orderly, well defined, clearly demarcated stages. The first stage of creation was represented by the Egyptians as Atam/Atum/Atem, emerging out of Nu/Ny/ Nun—the neutron soup. Throughout the Ancient Egyptian texts, we consistently find how one state of being develops (or better yet, emerges) into the next state of being. And we always find that any two consecutive states are images of each other. Not only is that scientifically correct; but it is orderly, natural, and poetic. The Egyptians were famous for writing these scientific and philosophical subjects in poetic forms. Numbers conform to the arrangement of natural things; for most natural things were established by the Creator in orders. Numbers are neither abstractions nor entities in themselves. Numbers are names applied to the functions and principles upon which the universe is created and maintained. We have seen how an orderly creation in the form of Atam, the Complete One, emerged out of the pre-creation chaotic state of the Nun—the nothingness. We have also seen how one state of being develops or emerges into the next state of being, and how every two consecutive stages are images of each other. Nun and Atam are images of each other, like the numbers 0 and 1—0 is nothing, nil, and 1 means the all. The first thing that developed from the light of unity of the Complete One was the force of Active Reason, as He made two arise from one, by repetition. It is Isis being this Divine-Mind (or Divine-Intellection, or Divine-Intellectual-Principle) that begins the existence of Plurality, Complexity, or Multiplicity. The relationship between the master of the universe—The Complete One—and the mother of creation is best described in musical terms. The relationship between Atam—the Complete One—and his female image (Isis) is like the relationship between the sound of a note and its octave note. Consider a string of a given length as unity. Set it vibrating; it produces a sound. Stop the string at its midpoint and set it vibrating. The frequency of vibrations produced is double that given by the whole string, and the tone is raised by one octave. The string length has been divided by two; and the number of vibrations per second has been multiplied by two: one half (1:2) as created its mirror opposite (2:1), 2/1. This harmonic relationship is represented by Atam and Isis. Isis’ number is two, which symbolizes the power of multiplicity, the female mutable, receptacle, horizontal, representing the basis of everything. In Ancient Egyptian thinking, Isis as the number two is the image of the first principle—the divine intellect. – The daughter of the universal Lord. – The Light-giver in heaven with Re. Isis, then, is the emanated energy from the Complete One. As the female principle in the universe, only she can conceive and deliver the created universe. -The Lady of the beginning of time. -The prototype of all beings. -The greatest of the neteru—[meaning the divine forces]. -The Queen of all the neteru. Isis is recognized in the Ancient Egyptian texts as the God-Mother. How loving Isis is—our God-Mother. She—the female principle—is the matrix of the created universe – ‘matrix’ being a motherly term, mater-x. On the intellectual level, the first thought is to devise an orderly plan. The Ancient Egyptians emphasized the orderly and harmonic nature of the creation process, with Maat representing the Divine Order and Harmony. Maat is one of the manifestations of the female principle Isis. The first step to start creation was to conceive the concept of the multiple (divine beings) out of the One. The God-Mother Isis conceived the plan—metaphysically or intellectually—in her loving heart. This is both eloquent and poetic, because the heart was/is considered to be a symbol of intellectual perceptions, consciousness, and moral courage. Isis, as such, is also recognized as the Mighty Heart. How eloquent that the Divine Mother Isis, being the womb of the universe, is also the one who conceived the creation plan and then delivers its parts; being her children and their children. The Ancient Egyptian texts emphasize an orderly sequence of creation which is basically a system of necessary emanation, procession, or irradiation accompanied by necessary aspiration or reversion-to-source. All the forms and phases of Existence flow from the Divinity, and all strive to return thither and to remain there. Now, with the plan of creation being conceived in the Divine Reason, the next logical step is to bring it to life. Therefore, Isis—the Divine-Thinking – engenders a power appropriate to the realization of its Thought. The bringing to life or animation of the creation plan is brought on by the All Soul, or Universal Soul of the All. The universal soul was represented in Ancient Egypt by Osiris, the third in the sequence of creation, and the number 3 was communicated through him. Osiris is the eternal emanation and image of the Second Hypostasis, the Intellectual-Principle. Every stage of creation tends to engender an image of itself. It tends also to rejoin the next highest, of which it is itself a shadow or lower manifestation—for Isis is an image of the first principle, and her shadow is Osiris. How enlightening! – Isis, the Bestower of Life. – Isis, the Lady of Life. – Isis, the Giver of Life. – Isis, the dweller in Neteru. As we have seen, it takes three components to create and bring something to life. So the prototype of generations encompasses three elements of the Creator Trinity, which are represented in the briefest description. The first is The One, or First Existent—called Atam by the Egyptians; The Complete One—the One who is the all. The second is the feminine principle called Isis which contains the Divine Mind, or First Thinker and Thought – the place of metaphysical and physical conception—the womb, the chamber, the entire universe. The third is the masculine, animated, lively, dynamic, energetic principle called Osiris, known as the Universal Soul. The Ancient Egyptians recognized the significance of trinity in the creation process. As such, Ancient Egyptian texts rendered the trinity as a unity expressed by the singular pronoun: it is the Three that are Two that are One. The Egyptian text shows us that Unity, becoming conscious of itself, creates polarized energy – two new elements, each of which share in the nature of the One and of the Other. In other words, each of the female and male principles partakes of the other. On the intellectual level, the female principle is both passive and active, for Isis conceives the plan in a passive mode, then provides life to the plan; thus reflecting her activeness as an extension of her passiveness; i.e. the intellect and world soul stand in the relation to active and passive intellect. Intellect is as it is: always the same, resting in a static activity. This is a feminine attribute. Movement towards it and around it is the work of Soul, proceeding from Intellect to Soul and making Soul intellectual; not making another nature between Intellect and Soul. And on the soul level, Isis is the passive and Osiris the active soul. Again and again, we find the sequence of creation is based on one stage being the natural progression as well as the image of the following stage—and in reverse. From active-passive to passive-active is the chain reaction (so to speak) of creation. Time is presented as the ‘life’ of the Soul in contrast to Eternity, which is the mode of existence of Intellect. However, Soul is an entity that spans various levels of reality, and we find that, on occasion, the highest aspect, at least, of Soul is largely assimilated to intellect. The relation of the soul to the intellect is like the relation of the light of the moon to the light of the sun. Just as when the moon becomes full from the light of the sun, its light becomes an imitation of the light of the sun in the same way when the soul receives the effusion from the intellect, when its virtues become perfect and its acts imitate the acts of the intellect. When its virtues become perfect, then it knows its essence or self and the reality of its substance. The combined forces of the divine mind and divine soul make the creation of the natural world possible. Isis as the Divine-Intellectual-Principle has two Acts: that of upward contemplation of The One and that of ‘generation’ towards the lower All-Soul. Likewise, the All-Soul has two Acts: it at once contemplates the Intellectual Principle and ‘generates’ (in the bounty of its own perfection) the Nature-Looking and Generative Soul, whose operation it is to generate or fashion the lower, material Universe upon the model of the Divine-Thoughts; the ‘Ideas’ laid up within the Divine-Mind. The All-Soul is the mobile cause of movement as well as of Form (or material or sense-grasped Universe) which is the Soul’s Act and emanation, image, and ‘shadow’. With the combined forces of female and male energies, the creation plan can come to life. Two symbolizes the power of multiplicity—the female, mutable receptacle – while Three symbolizes the male. This was the music of the spheres—the universal harmonies played out between these two primal male and female universal symbols of Osiris and Isis, whose heavenly marriage produced the child Horus (number 5). The significance and function of number five, in Ancient Egypt, is indicated by the manner in which it was written. The number five in Ancient Egypt was written as two ?? above three ? ? ?, (or, sometimes, as a five-pointed star). 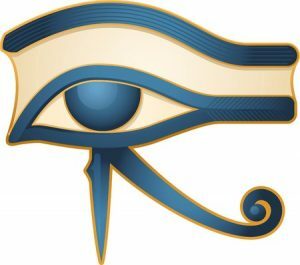 In other words, number five (the son–Horus) is the result of the relationship between number two (the mother–Isis) and number three (the father–Osiris). 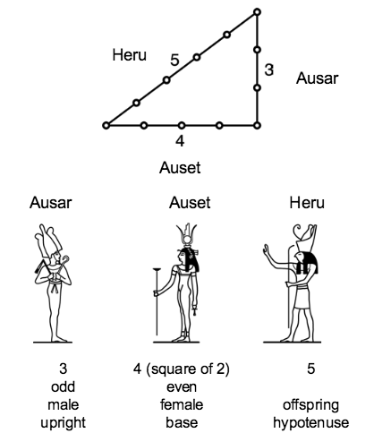 The sequence of numerical creation of Isis followed by Osiris followed by Horus is 2,3,5, etc. 89, 144, 233, 377, 610, . . . The Summation Series is reflected throughout nature. The number of seeds in a sunflower, the petals of any flower, the arrangement of pine cones, the growth of a nautilus shell, – all follow the same pattern of these series.